The Professional Series™ commercial-grade mowers are built for a wide range of turf customers including municipal parks and green spaces, schools, airports, cemeteries, sports fields and golf courses. The series includes three lines of zero-turn mowers and six different models of utility vehicles. The flagship of Jacobsen’s new Professional Series is the RZT line of ride-on zero-turn mowers, which provide the power and performance to handle any turf job with ease. The RZT mows up to 5.3 acres per hour with either a 25 or 27 horsepower (hp) Kawasaki® FX engine or a fuel efficient 27 hp Kohler® EFI engine. 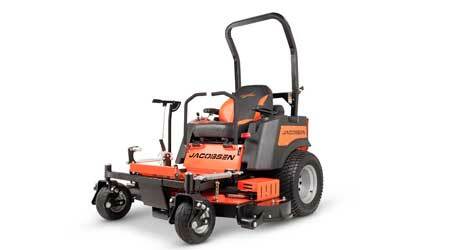 Jacobsen’s SZT stand-on mower packs power into a small footprint and features a 26 hp Vanguard® engine and two different deck sizes. The new mower series is rounded out with the WZT walk-behind mower. The WZT features an 18 hp Briggs & Stratton® engine and single or dual-drive drivetrain options.